0800: Team PJ arrives at BHP station, half an hour earlier than planned. We have mamak breakfast. 0830: Where is Team Jazz? We wait some more. 1000 : Chicken crossing the road incident befell Team Jazz. Luckily chicken gets away with only loss of a few feathers. Team Jazz driver is stunned for a while. We arrive at Kuala Gandah Elephant Sanctuary, about 14km from Lanchang exit. You need to take the LPT expressway, then exit at Lanchang. Entrance fee : Free. However, you can make donations if you want. 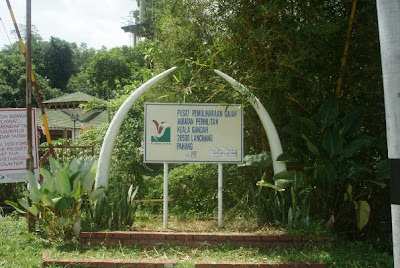 The sanctuary is under Jabatan Perhilitan, hence it gets funding by the government. Some pestering of the counter girl to get the yellow ticket. Only 4 of us gets the yellow tix, the rest gets red tix. Red tix: Gets to watch yellow tix holders ride and bathe the elephants. Oh ok, red tix holders get to bathe baby Jeli actually. 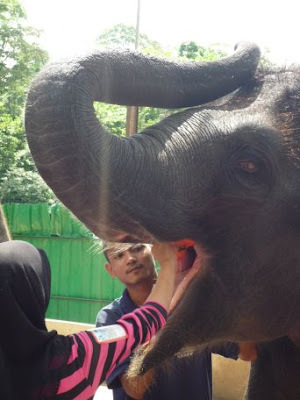 We feed the smaller elephants, Selendang, female; 5 yrs old and her friend (forgot to ask its name); 4 yrs old. 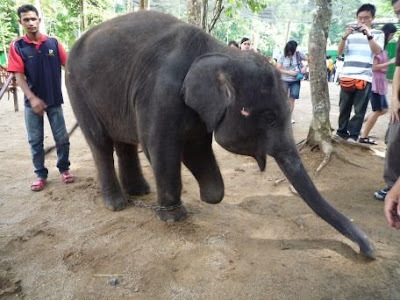 Selendang was found in nearby Rompin, her front left leg was caught in a booby trap. She lost her hoof/toes, but can now walk with all fours, although a bit difficult if walking on rocky surfaces. Say no to poaching! 1100 : Detour to Deerland Park while waiting for “elephant activities”. It’s just 10 minutes away. Entrance fee : RM5 per person. Note: This is a private park, hence the fee. 1300 : It's human feeding time now! We have our lunch at Lanchang town. A small, quiet town. Nice Malay kampung lunch! 1400 : Back to Kuala Gandah. Activity starts with feeding. We feed the elephants with fruits. You put the fruits on their tongue; they will roll it in their mouths and munch them. Elephants have molars only. Actually, they have incisors (the tusks). But female Asian elephants don’t. Next is riding time! 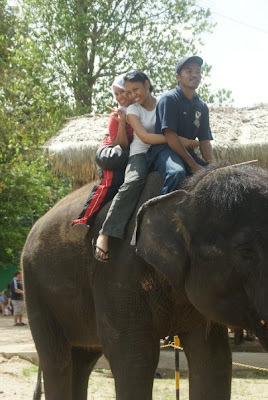 Liza, Wawa, Abai and Manto ride the elephants. The rest watch them ride. Finally Liza gets to ride an elephant; her dream since her Phnom Penh trip! But it was quite a bumpy ride, according to her. Final activity: Bathing! I wait first in line while the others were riding. 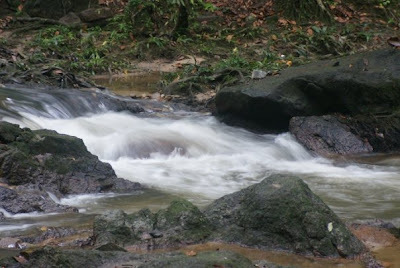 It is sweltering hot, so I can’t wait to jump in the erm, quite teh tarik river. But it doesn’t matter, because sungai teh tarik is still water; and water is very much welcomed on a very hot day! Naughty jumbos! We sit on them, then they tilt and throw us off in the river! But it is really fun! ;-) We then bathe them; in return we have jumbo showers, courtesy of their trunks, nice! 1600 : Stop and rest at Lanchang R&R. We then decide to go bathe at a waterfall! 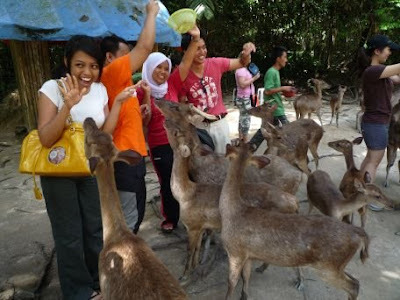 1700: We arrive at Hutan Lipur Lentang, just off the Karak Highway. A signboard will direct you there. It is raining though. But we decide to bathe anyway, since we already came so far, and there is no thunder and lightning. The water is very refreshing! Beats any hydrotherapy pool or Jacuzzis! 1900: We finally head home. But before that, dinner at Tmn Melawati, cheap and nice!